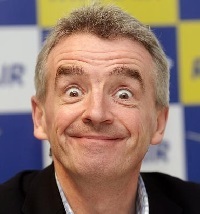 Ryanair has announced that its corporate Boeing B737-700, the Michael O'Leary private jet, is again available for corporate/group hire. According to the press release it is being crewed by “Ryanair pilot and cabin crew professionals”, which sets up the question what is a normal Ryanair flight crew – a bunch of amateurs? Fine-dining catering facilities are available, no baggage charges, 48in seat pitch and a proper 2+2 for up to 60 passengers. Don’t blink. It’s true. And you can use an airbridge if available. The cabin staff really have to be good. Otherwise it’s back to line duties! ''no baggage charges''....I do finfd that hard to believe!! Fine dining? Fortnum & Mason sandwiches then!